This is a cross-post from WebStorm & PhpStorm blog, originally posted by Sergey Simonchik. From now on, users of JsTestDriver can measure code coverage visually, right in the editor with JsTestDriver plugin for IntelliJ IDEA. Make sure you have installed 11.1.2 EAP with the latest version of the plugin. To illustrate the case, we have created a sample project for you. When you open percentage-test.js for the first time, you will see error highlighting on the TestCase method call expression. Position the caret on the error-highlighted code, press Alt+Enter/Option+Enter and choose “Add JsTestDriver assertion framework support” from the list of available intention actions. Before you can run any of your tests, you need to start the test server and capture at least one slave browser. The server does not have to reside on the machine where the test runner is located; similarly, the browsers themselves may be located on different machines. To launch the JsTestDriver server, look for the tool window at the bottom of the screen. Click the green arrow to the left of the address bar to start a local server. The status bar turns yellow to let you know the server is running, but has no slave browsers. Click the browser icon you want to capture. Alternatively, you can copy the capture URL and paste it in a browser. The status bar turns green, and the corresponding browser icon lights up. Now you’re ready to run tests. 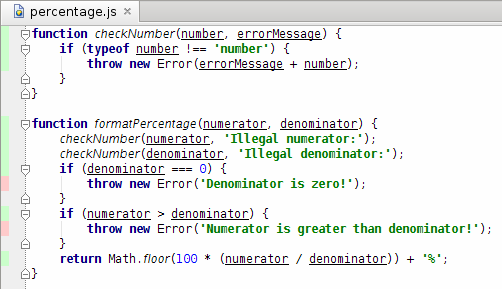 To run tests, right-click percentage.jstd and choose Run ‘percentage.jstd’ with Coverage. Tests will be run against the local JsTestDriver server and you will get a tree diagram. We’d appeciate to hear responses from you in our issue tracker ;). I hope it will implemented very soon in IntelliJ Idea. Code coverage only works on files declared in the “load” section. The problem is that we use a module loader RequireJS that does the loading on its own. Instead js files in jsTestDriver are declared under the “serve” section. Files in that section do not have code coverage. 1) A binding to com.google.jstestdriver.guice.BrowserActionProvider was already configured at com.google.jstestdriver.coverage.CoverageModule.configure(CoverageModule.java:66). Yes, indeed, JSTD configuration file collided with intellij’s coverage. Fixed version of NodeJS plugin is available for IntelliJ IDEA 11.1.3 EAP.